The GO7 XSE offers true ease of use with intuitive touchscreen controls that smartphone and tablet users will find instantly familiar. Tap to create or select waypoints, pinch to zoom, or tap and drag to pan smoothly across charts. Simple home screen and menu layouts make all functions quickly accessible, with large and clearly-captioned icons that are easy to recognize and tap. The GO7 is an ideal fit aboard Rigid Inflatable Boats (RIBs) and sportboats, offering a range of functions from navigation, engine monitoring, and even control of your onboard sound system. GO Auto: Choose from multiple Do-It-Yourself autopilot packs. On-screen, fingertip control from any GO XSE display. Affordable automatic steering for hydraulic-steer and cable-steer engines. Everything you need in one box to fit an autopilot. GO Fish: Choose from an array of built-in sonar technologies. Cruise with confidence using ForwardScan™ forward-looking sonar, or find fish like a pro with Broadband Sounder™ CHIRP sonar plus StructureScan® HD SideScan and DownScan Imaging™. TotalScan™ Transducer: This model adds the TotalScan transducer to your GO XSE system so get all your sonar technology in one package. TotalScan matches proven Broadband Sounder™ and CHIRP sonar with SideScan and DownScan Imaging™ technology, making it possible to target fish and search for fish-holding structure with the same transducer. GO Loud: Control your onboard sound system, monitor engine data and more over NMEA 2000. Compatible with the SonicHub2 Marine Audio Server with integrated Bluetooth, allowing you to stream music—including Pandora—from a smartphone or tablet. A massive leap forward in fish-finding technology, FishReveal makes it easier to see fish on DownScan Imaging™. Unlike traditional CHIRP views that provide strong fish targets, but lack refined structure detail, or DownScan Imaging that provides photo-like images of the bottom and structure details but shows fish targets as tiny dots -- FishReveal Smart Target Viewing blends the best data from both, eliminating the need for split-screen viewing and interpretation. C-MAP charts just got a major upgrade in readability that is most apparent near shore, where colors used for land, docks, anchorage areas, water, and channels are nicely differentiated and water contour lines are distinct. The new palette makes it easier to tell where the boat is in relation to a channel, navaid, ledges and drop-offs, or a point of land. The color scheme is also much easier on the eye. Get faster and easier navigation with automatic route planning. This feature simplifies route creation by automatically plotting the shortest and safest course based on the boat's draft, beam and height; creating a route around a landmass, shoals and other fixed navigational hazards. Autorouting requires a C-MAP MAX-N+, Navionics+ or Navionics® Platinum chart. 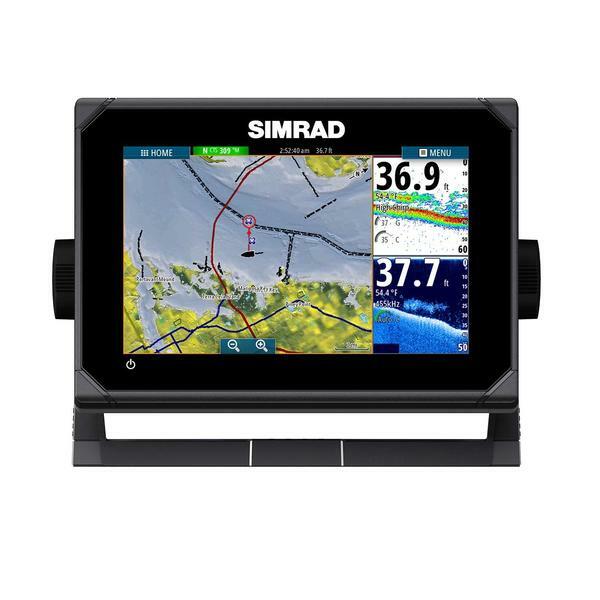 Control the Xi5 trolling motor* from the touchscreen of your Simrad display, making it easy to maintain your current position or navigate to a new one without leaving the helm. Navigation options include navigating to cursor, a heading, waypoint, along with a route, or pre-defined turn pattern. Caps (2x, on NMEA 2000 and Sonar connectors). The GO9 XSE has an additional cap for the Radar connector.